Bubbles is a former pet from Louisville, Kentucky who arrived at the PRC in 2012. 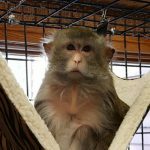 She had been illegally purchased by her owner after the passage of the 2005 state regulation banning the private ownership of all primates and other exotic animals in Kentucky, and was confiscated by Fish & Wildlife. Bubbles is now thriving with her friend and roommate Ciera, with whom she can spend afternoons in the sunshine grooming and foraging for seeds and nuts.